An outdoor clothing manufacturer well-known for its environmental sustainability efforts, Patagonia's e-commerce presence is very noticeable. However, according to a study comparing Patagonia to REI, Patagonia.com's usability falls short to its competitor. Patagonia's web presence seems to suffer a higher rate of abandons and a slightly lower ease of use rating. To explore what might contribute to the inferior user ratings, I created a persona that represents the target audience. This ideal persona is a young male adult with a strong interest in athletic apparel and fashion. Daniel is an outdoor enthusiast. Every chance he gets, Daniel would plan weekend camping trips with his friends and family. He is very environmentally conscious and prefers quality over quantity. Daniel wants outdoor apparels that are trendy and long lasting. With a hectic 9-to-5 schedule, Daniel needs a company that makes its products easily accessible online. 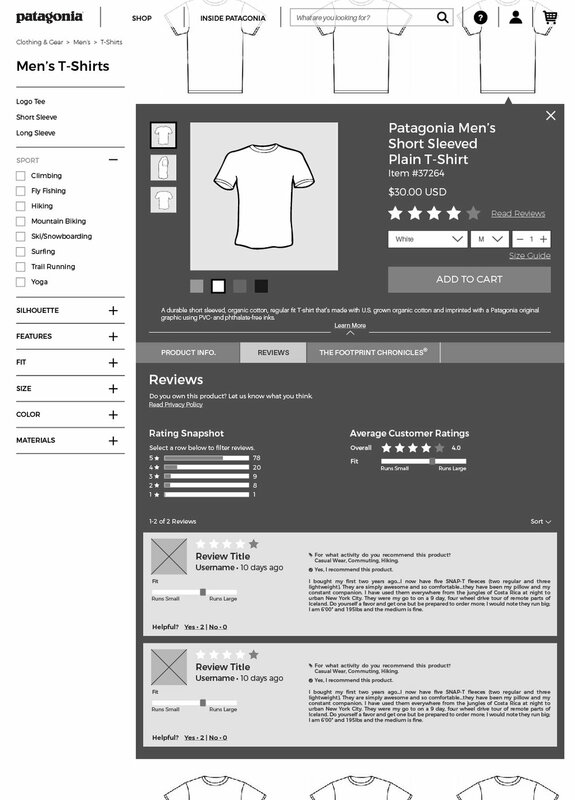 Now knowing Daniel's needs and values, I can check out how users similar to himself might use Patagonia.com. 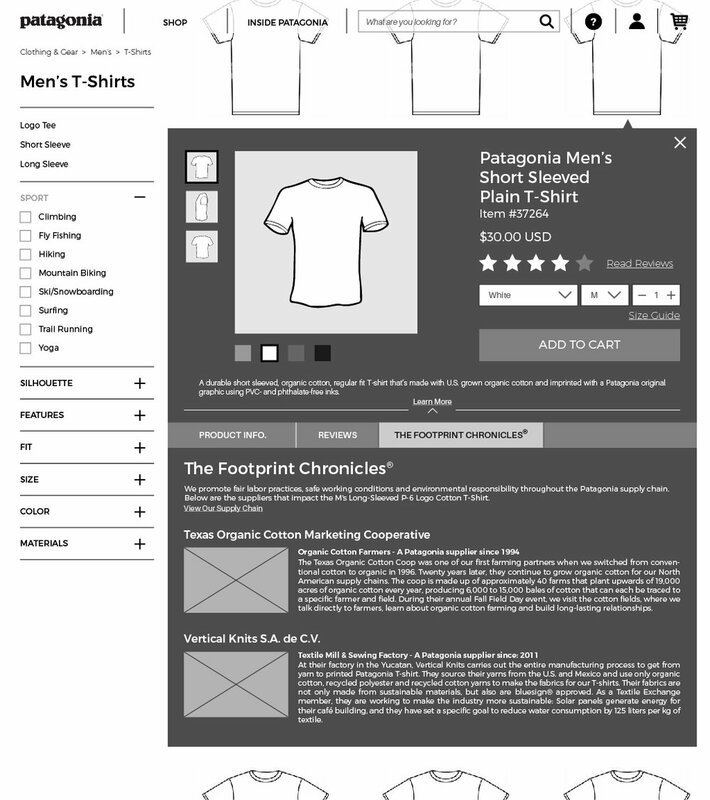 Looking at the user flow I created for Daniel, I see that window shopping on Patagonia.com might become time consuming since every product Daniel considers buying requires two page loads (one for loading the product page and one for loading the previous results page). I may be able to shorten the time Daniel spends waiting for the pages to load by making product pages inlays instead. This way, only the needed information gets loaded on request. And by keeping Daniel on the same page at all times, I welcome a smoother transition between tasks. Once I have identified potential usability issues Daniel might encounter, I can start to put the pieces together by giving my design structure through wireframes. 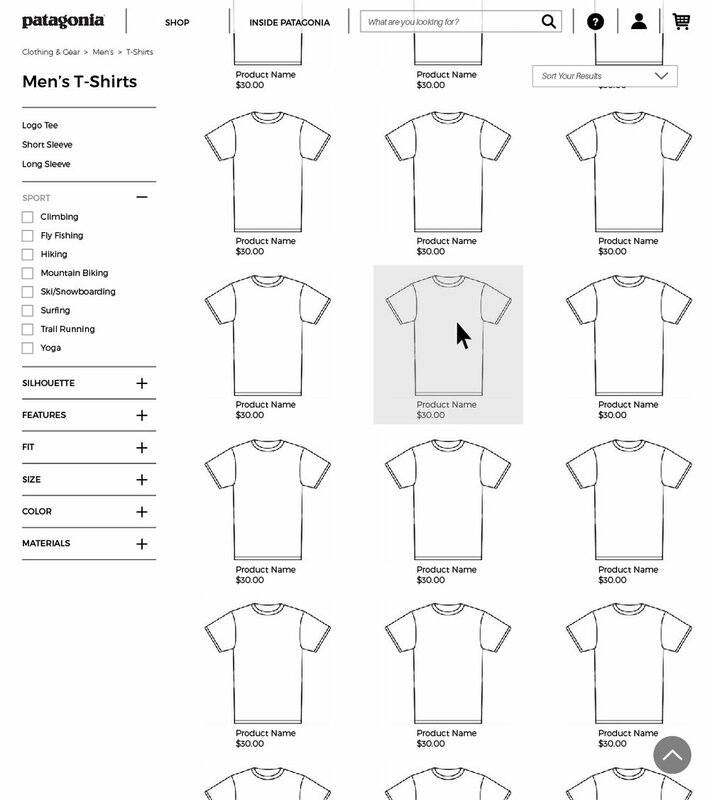 Since mobile users are now a big part of the e-commerce world, I must also consider scenarios with Daniel accessing the website from his smartphone.